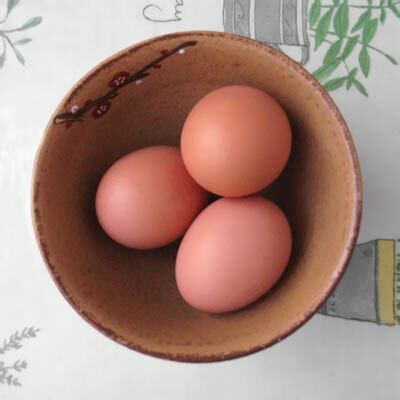 So far in previous posts I have written facts & tips on how to use the essential baking ingredients: flour, eggs & sugar. This week is about Butter. Just like the others, knowing how best to work with butter is vital for successful happy baking! Butter is essentially the concentrated fat of the milk with some water. It is made from milk, cream or both of these ingredients. Commercial butter may even be made from whey which is taken during the cheese making process. The colour of the butter varies from dark yellow to creamy white – this is due to what the animal’s are fed on, or is sometimes manipulated with food colourings. The basics of butter making is simple – they produce it by churning the milk/ cream until the fats separate from the liquid (buttermilk). What is the best way to store butter? Storage of unsalted butter: up to 2 weeks refrigerated & up to 5 months frozen from day of purchase. Storage of salted butter: Salt gives better shelf life; up to 2 months refrigerated & up to 6-9 months frozen from day of purchase. Make sure it is properly sealed in its foil packaging to avoid it turning rancid from exposure to air, & away from smelly foods as it readily picks up odour. The best way to defrost is to place the required amount in the fridge for 6 hours – never leave it in room temperature as it’ll end up with water droplets sweating out of it. How soft is room temperature butter? How do I achieve it? You can tell wether you’ve achieved ‘Room temperature butter’ when the softness allows you to ‘easily’ depress the surface with your finger, at the same time not melting. To obtain it, all you have to do is to leave the quantity of butter your recipe requires (still in its packaging) out in the room for 30 minutes. – I never have the time nor patience to do that (or indeed remember to take it out in advance), so I just cube my block of butter straight from the fridge & zap it in the microwave at 10 second intervals at first & then careful 5 second gaps until the right consistency is reached. Easy peasy. How do I cream butter? And Why? 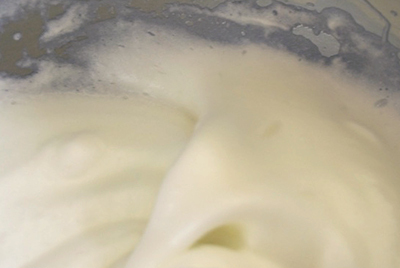 To cream butter, first start off with cubed butter that has been softened to room temperature. Place in a deep mixing bowl (so that it doesn’t spit everywhere) & using the mixer, beat it till it is ‘creamy’, soft, smooth & light from incorporating the air. Use immediately. 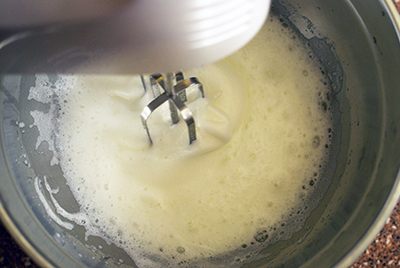 Typically, many sponge recipes require you to whip the butter to a cream texture before you add the sugar. 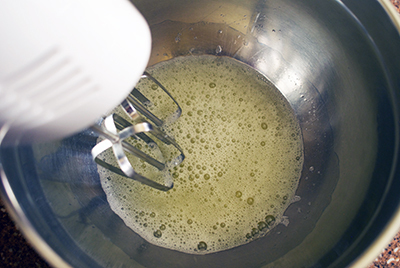 Once sugar is added to correctly creamed butter, it has incorporated the air in to it which would then cause a foaming action in sponge cakes. 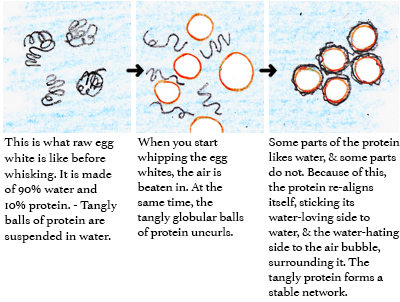 (when the cake batter is in the oven, the incorporated air is like a bubble, trapped, & it eventually ‘sets’, leaving tiny holes in your soft sponge). Why do baking recipes call for ”unsalted’ butter’? Salted butter is tasty for spreading on your morning toast, & its shelf-life is a lot longer than unsalted. But for baking, the taste of salt gets in the way, & besides, salted butter browns faster. So even if a baking recipe such as madelaines, pies, and buttercakes call for salt, you’d use unsalted butter and then sprinkle in the salt separately to control its saltness. How do I make home-made butter? Please follow this link for an online recipe I found. One tablespoon of butter (14 grams) contains 100 calories, of which 7 grams are saturated fat, and 30 milligrams of cholesterol. 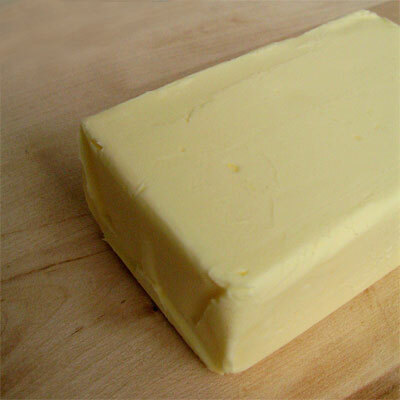 In other words, butter consists mostly of saturated fat and is a significant source of dietary cholesterol. For these reasons, butter has been generally considered to be a contributor to health problems, especially heart disease. Also, people with milk allergy need to watch out. Can I substitute butter with margarine? In principle yes – they are both fats. But if you are doing it for health-conscious reasons, you’d have to be aware that there are loop-holes. Some margarine contain trans fats (the main dietary culprit in raising blood cholesterol) so please read the back carefully. The water content is slightly different between the two, & because of this, the careful balance of the recipe will be mucked about & the result will not be perfect. Also the melt point is different (butter melts at body temperature, while margarine melts at higher than 98.6 degrees) which can only get you further away from what the recipe had originally been planned to do. I personally never will substitute my butter. Margarine lacks flavour & is greasy on the palate. Butter is a natural ingredient, & is in these baking recipes for a purpose, for such examples as giving a rich buttery flavour & to enhance the other ingredients. After last Saturday’s successful return to the market after my 1 month break, I’ve cranked up my energy & work-volume to Max & am buzier than ever with making n’ baking! Sugar is a staple in everyones kitchen, & is used extensively in confectionery. 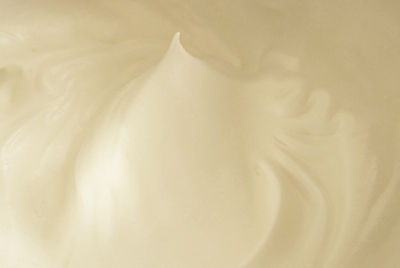 Obviously it is sweet, but it’s more than that – it provides moisture, tenderness, enhances other flavours, provides stability in meringues, can caramelize, can even be bitter & increases shelf-life (A good example is jam. High percentage of sugar prolongs shelf life as it inhibits the bacteria to grow). But did you know that there are dozens of varieties of it available? It’s a minefield. It can be mystifyingly confusing… Before my obsession with baking I don’t think I ever used anything other than white refined granulated sugar! Granulated ::::: Very versatile, all-purpose sugar but one-dimensional in flavour. No aroma, so it’s great when you just want to have the ‘sweetness’ & pronounce the flavour of the other ingredients such as chocolate in a chocolate cake. – If a recipe doesn’t specify which sugar type to use, it’ll be safe to use granulated. Castor ::::: Selectively sieved from the granulated sugar. It’s known as caster sugar because it is suitable for placing in a ‘caster’, a perforated jar or a bottle, similar to a flour dredger. Icing ::::: It rapidly dissolves even in cold water. A must when you make meringue for macaron. Also great for dusting it on top of your finished product. It is made by grinding sugar to a very fine powder. A small amount of anti-caking agent (for example 3% cornstarch) is often already added to it to prevent clumping. Preserving sugar ::::: Often used for jam making, it has the largest crystals that dissolves slowly which makes it less likely to burn the sugar as it does not settle in the bottom of the pan. It also reduces the need for stirring. Less froth is also produced resulting in a clearer preserve. ‘Golden’ caster or granulated sugars ::::: Molasses is ‘painted’ to the white sugars to add the light golden colour & aroma. Slightly more flavourful than the white. Demerara::::: Free-flowing crunchy crystals. Also good for sweetening beverages such as coffee. Light/ Dark Brown ::::: Based on caster sugar. The molasses is ‘painted’ to give it colour & give depthy, fudgy flavour. (In some cases ‘food colour’ is painted on instead of molasses, to recreate the delicious brown look.) It’s moist, & it gives extra tenderness to the cake. Make sure to not let it dry out & it’ll be hard like a rock. All of the above can be substituted with each other in principal. They come from the same stage of sugar process, & some are just that they are various crystal sizes depending on what you’d like to use it for. The confusing part is… some of these can come as refined (bleached, refined white sugar which is pure sucrose/ carbohydrate), partly refined, or unrefined (typically 50% less processed than refined. It retains some of the natural properties, making it wholesome & healthy). It could be under naming such as ‘natural’ or some brands call theirs differently. You really have to study the package before purchase. Light/ dark Muscovado::::: Unrefined natural sugar. Strong tasting natural molasses flavour. Brown & sticky. More unprocessed than Turbinado Sugar. Turbinado::::: Unrefined. Similar in appearance to brown sugar with molasses flavour but paler & course granulation. Often used in tea. This sugar can’t always be substituted in recipes. Its moisture content varies considerably which can affect a recipe. You’d have to carefully adjust other ingredients such as the liquids. Unrefined Soft Light/ Dark Brown::::: Distinctive caramel taste. Light & dark soft brown sugars can be replaced with one another only in small quantities. If you do, the cake will not turn out like you wanted it to, because the flavour & moistness is different between the two. Molasses ::::: Dark syrup extracted during sugar manufacturing. Only a little is needed as it is very concentrated. Not as sweet as sugar. Replace no more than half the sugar called for in a recipe with molasses. Honey ::::: Distinctive flavour that varies depending on which flower nector the bees have been gathering. Generally, honey can be used in place of granulated sugar, it’ll make the cakes moist & dense. But watch out, it is 25 – 50% sweeter than sugar & tend to brown faster. So experiment with using less of it, it is said that you should use the amount of honey that is equivalent to ½ the amount of specified sugar, reduce liquid ingredients by ½, & reduce the oven temperature by 25 ¼ F.
Maple syrup ::::: Could be made from the maple tree sap, or artificially made with maple flavouring. Look for the word ‘pure’ when choosing. It has fewer calories & higher concentration of minerals than honey. Keep refrigerated and consume within 6 to 8 months. Invert sugar & Glucose Syrup ::::: It is highly effective in preventing crystallization, & so makes the mixture smoother with better viscosity. 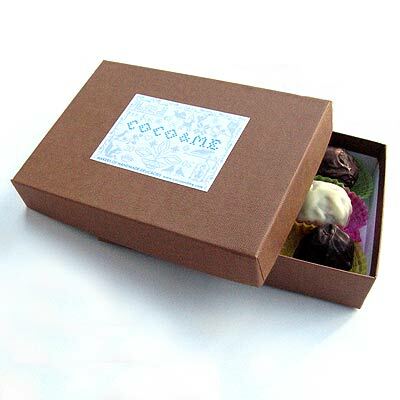 It is not as distinctively sweet or flavourful like the other sugars which is great when you rather want to pronouce the flavour of the chocolate itself. But inverted sugar is almost impossible to get if you are a home-user (it only comes in big multi-kilogram tubs) so try honey as a substitute. Trimoline ::::: It is produced from beets. It emulsifies the fat, & prevents recystallization of sugars. It smoothes the texture & increases shelf life by retaining moisture. It has a sweetening power of 128%. Sweet tasting liquid from the Sugar cane (a tropical grass) was first discovered on the islands of the Pacific Ocean some 20,00 years ago (!) but the process of making sugar by evaporating its juice developed in India around 500 BC. It is from then on that the technology for sugar production slowly spread around the world, although for many hundreds of years, sugar was a highly prized and expensive ‘spice’ that was used only in the homes of nobility and royalty, just like the history of chocolate. I recently came across the most insightful historic literature of how sugar was refined & then manufactured into loaf sugar back in 1876 London (loaf sugar was refined white sugar moulded into cone-shaped loaves – which then got cut up either by the retailer or at home using a cleaver & then pounded to powder). I love the way it’s written. Its not just an account of what it was like, but more like a good novel. It describes one of the workers as a creature with chest all grizzly-haired, calls it the ‘Sugar Ogre’ in waiting for juvenile delinquents. – It’s a bit long, but persist. I found that it was worth reading. 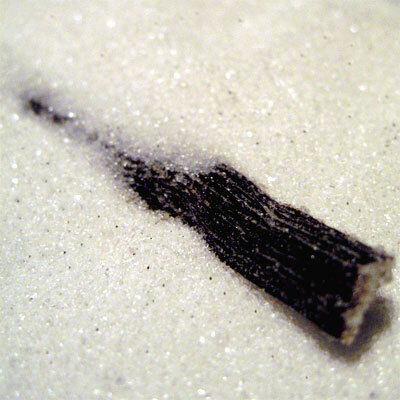 Vanilla sugar is simply castor sugar with vanilla. There are no set rules of how to make it. If you want, you can change the ratio of sugar/ vanilla according to wether you’d like the aroma to be intense or subtle. And you can keep replenishing more sugar in to the same jar & the pod would sufficiently flavour the sugar. 1. Chop the vanilla pod – for example, in half. If you’re using fresh pods, de-seed & then chop. 2. Place both sugar & vanilla pod (& seeds) in the jar & mix well, distributing the vanilla beans in the sugar. 3. Tightly seal with lid & store in a cool place. The sugar would be gorgeously scented in 1 to 2 weeks. It will keep indefinately without refrigeration. 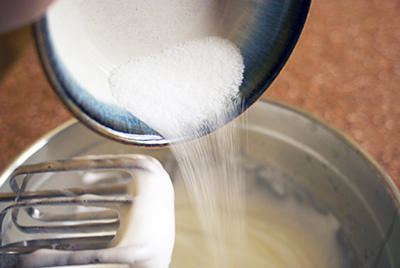 Use the vanilla sugar in baked goods & desserts that calls for both sugar & vanilla. Or sprinkle over home-made sponge cakes, biscuits, fresh fruit, custards, crème brûlée, crumbles, favourite breakfast cereal, hot coffee, milkshakes, yoghurt, buttered toast etc. I have been busy in the evenings making Chocolate Valentines Hearts for the oh-so-busy Valentine season that’s creeping it’s way. And my son has started nursery on Wednesday! A milestone. A bit of a tear jerker. It’s 1pm til 3.30pm, Monday to Friday. You’d think that it’ll give me more me-time, but it takes me 30 minutes to walk there, so by the time I walk him & go back home, it’ll only give me 1½ hours at home before I go & pick him up…!